The 27Project.org website has been updated. If you click on the 100 Photographs gallery link, instead of the previous gallery page a blank page with a single link "follow" in the top left corner is displayed. 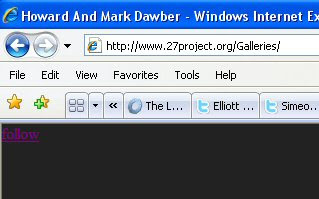 If you link to this page from the home page of 27project then this follow link takes you to a wikipedia page about King James II however if you go to another one of the pages and link to the 100 Photographs gallery the follow link takes you to a blog site called Toasty Doodle .This appears to be a post about a drawing of a candle, no obious references to Lost or this PARG (Potential ARG). A new blog post from Elliott Graves, so NEW POST !! can some tell me again why we are doing this. It's a fake fan made site. The follow link on the Gallery page has changed several time in the past 24 hours. Currently it takes you to @elliottgraves twitter page.